To develop a flow model for bovine livers for extensive bench testing of technical improvements or procedure-related developments of radiofrequency ablation excluding animal experiments. The perfusion of bovine livers directly from the slaughterhouse was simulated in a liver perfusion tank developed for the experimental work. The liver perfusion medium used was a Tyrode solution prepared in accordance with physiologic criteria (as for liver transplants) which was oxygenated by an oxygenator and heated to 36.5°C. Portal vein circulation was regulated via a flow- and pressure-controlled pump and arterial circulation using a dialysis machine. Flow rate and pressure were adjusted as for the physiology of a human liver converted to bovine liver conditions. The fluid discharged from the liver was returned into the perfusion system through the vena cava. Extendable precision swivel arms with the radiofrequency probe attached were mounted on the liver perfusion tank. RFA was conducted with the RF3000 generator and a 2 cm LeVeen needle (Boston Scientific, Ratingen, Germany) in a three-dimensional grid for precise localization of the generated thermolesions. Four bovine livers weighing 8.4 ± 0.4 kg each were prepared, connected to the perfusion system, and consecutively perfused for the experiments. Mean arterial flow was 569 ± 43 ml/min, arterial pressure 120 mmHg, portovenous flow 1440 ± 305 ml/min, and portal pressure 10 mmHg. Macroscopic evaluation after the experiments revealed no thrombi within the hepatic vessels. A total of 136 RF thermolesions were generated with an average number of 34 per liver. Mean RF duration was 2:59 ± 2:01 min:sec with an average baseline impedance of 28.2 ± 3.4 ohms. The mean diameter of the thermolesions along the puncture channel was 22.98 ± 4.34 mm and perpendicular to the channel was 23.27 ± 4.82 mm. 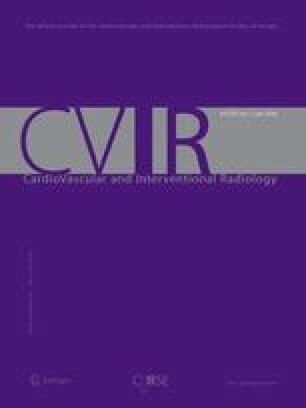 Extracorporeal perfusion of bovine livers with consecutive standardized RF ablation was feasible. The bovine liver flow model seems to allow extensive, standardized evaluation of technical or procedure-related developments of RF systems.